Led by Past Master Derek Hilton, a group of Livery Members with a keen interest in matters historical, recently visited Buckinghamshire Stately Home Penn House, seat of Earl Howe, with the prime intent of viewing the celebrated Prince Edward Cap dating back some 450 years. (The owner subsequently became Edward VI). 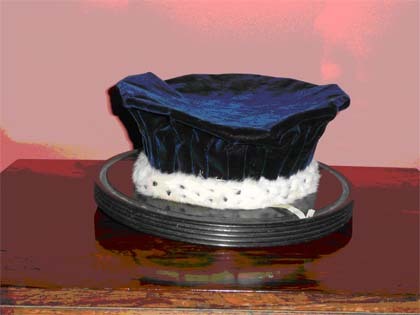 To the group’s delight, not only did they view and handle this exceptional item of the Hatters’ trade, they were given a conducted tour by the present Earl of the 400 year old mansion, and had an enlightening account of Admiral Earl Howe’s place in naval history in the late eighteenth century which resulted in his being made a Knight of the Garter, and being given a diamond encrusted ceremonial sword. We were able to view and enjoy Penn House’s superb collection of pictures featuring the Admiral’s triumphs, and also to view precious naval documents and log books covering the period 1784-1804. 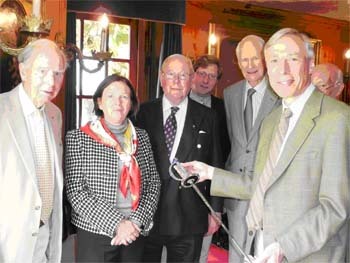 Earl Howe shows the ceremonial sword to members of the Feltmakers party. Penn House houses a fascinating variety of historic artefacts, ranging from pearls presented to the family by Henry VIII, which have their own ghost story to boot, associated with Hampton Court Palace, to early navigational aids and items of imperial nostalgia. The morning of the visit flashed by, and the Feltmakers present left to repair for lunch to the celebrated nearby pub/restaurant ‘The Hit or Miss’, realising how fortunate we are as a nation to have such treasure troves of living history on our doorstep.